“Flu-ouise” is one hell of a quietly confident season premiere. It’s an extended detour into the Miyazaki-like world of Louise’s beloved Kuchi Kopi. It’s a musical episode, then an increasingly annoyed meta-parody of a musical episode. It’s a funny, sweet little ensemble piece about the Belcher family trying to spare themselves Louise’s wrath, with Teddy sprinkled in for good measure. 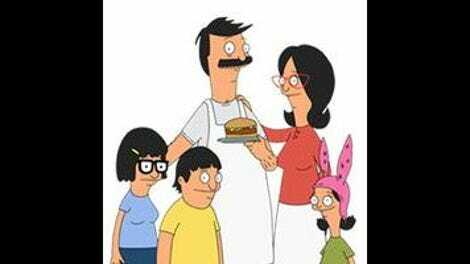 It’s hard to imagine any better proof of how far Bob’s Burgers has come as it enters its seventh season than the fact that it can so effortlessly commit to all these wildly divergent narrative strands and make them cohere into such a wonderfully enjoyable greater whole. All the little details are right, from the subtly ominous Kuchi Kopi who serves as Louise’s companion to unabashed delight Bob and Teddy take in discussing Clyde’s performance of the Kuchi Kopi story. This is just a hugely fun way to kick off the season. 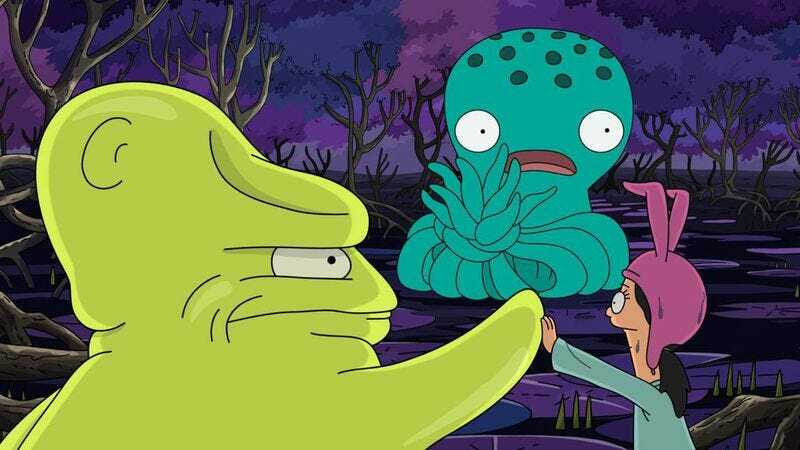 If there’s an issue with “Flu-ouise,” it’s that the episode isn’t necessarily reaching for that extra level of character-based storytelling, like the very best Bob’s Burgers episodes do. Yes, the arc of Louise’s fever dream is about her learning to forgive her family, but the story as told doesn’t carry a ton of weight. After all, Louise herself feels far less strongly about her situation than the deranged Kuchi Kopi does, which externalizes her issues without keeping them connected to her own story. She spends most of the dream being vaguely irritated with her family but not connecting that with her encounters with her other toys—which, because I can’t spell any of them, I’ll just follow Linda’s lead and refer to as “Hello Kitty”—or picking up on the threatening hints from her traveling partner. It doesn’t feel like she’s rejecting anything particularly crucial when she pushes the button at episode’s end. It’s nice that she ends up forgiving her family, and that’s a sweetly satisfying end to a really good episode, but “Flu-ouise” doesn’t do the work that previous Louise episodes have done in getting the audience truly invested in that closing about-face. The result is that this episode feels a little insubstantial when it comes to the character stuff. When there are other Bob’s Burgers episodes that are just as visually ambitious and consistently funny while also pulling off a big character arc, that’s got to be a slight demerit for “Flu-ouise.” But really, only a slight one: This premiere is so solid in all its other aspects that it can get away with an undercooked emotional arc. And none of this is to say this episode doesn’t still get its characters, even if it ends up exploring them more superficially than one might hope. Bob’s open, uncomplicated fear of his youngest child is always a hoot, as he immediately suggests they flee the house when he learns of the damage done to Kuchi Kopi. At the same time, tonight’s episode is smart to not play this too broadly, as the Belchers do generally deal with the unfolding disaster as just a slightly exaggerated version of a typical family. When Bob tells Teddy they’re busy dealing with a crisis, there’s a nicely realized sense of reality to that line, and it makes Teddy’s own idiosyncratic obsessions—the hockey game, his beloved childhood toy and the sound it makes—all the more ridiculous when he refuses to shut up about any of them. As great as the sequences in Kuchi Kopi’s realm are, the true highlight of the episode comes with Bob and Teddy’s late-night visit to Clyde’s toy shop. This is Bob’s Burgers at its warm, non-judgmental best, as it takes a truly ridiculous, possibly pathetic character like Clyde and ends up respecting the hell out of him. The initial detail that he’s been wearing a bathrobe as a jacket would be reason enough to dismiss him, yet his passing observation that he’s been wearing it that way for a while—and his offhand dismissal of Bob and Teddy’s attempts to compliment him—suggest he’s aware of how ridiculous this is. The fact that he cares so deeply about toys to insist on reading the Kuchi Kopi books to Bob could also be a joke at his expense, but again, we have Bob and Teddy’s rapturous reviews on the way back to set us straight. What could be a particularly ludicrous digression from the main action ends up being a vital part of the episode’s overall tapestry, one that is equal parts funny and sweet. That’s a pretty terrific balancing act for the premiere to pull off. Besides, “Flu-ouise” earns its place in the upper echelon of Bob’s Burgers episodes on the strength of its animation alone. Its depiction of Kuchi Kopi’s realm isn’t necessarily a big departure in terms of the overall animation style, but it’s a fun choice to have the other toys resemble the Belchers only in terms of mannerisms and personalities—they sound and act like Louise’s family, but they don’t especially look like them except in the broadest brushstrokes. That opens up a novel line of visual humor, with the contrast between the toys’ fantastical appearances and their mundane, Belcher-like attitudes adding to the general hilarity of the episode. A particular favorite is Linda’s octopus, which is adorable in a way wholly divorced from Linda’s usual appearance—at least until it realizes its bound tentacles would make a lovely ponytail, which is just about the most Linda thing imaginable. In some ways, this is all the flip side to what I previously talked about as the one weakness of the episode. “Flu-ouise” could have hit its themes and character beats harder in its fantasy sequences, but that would have likely meant drawing even closer visual parallels between the toys and Louise’s family, or using their actions as more obvious allegories for Louise’s frustrations with their failures. The episode doesn’t go down this more obvious route, instead casting the other Belchers in a more broadly drawn fantastical adventure. It’s not as tightly focused on Louise learning a specific lesson or working through her issues as it could have been, which—whatever weaknesses that might entail—does mean the episode can throw in delightful, generally Belcher-like character bits like the bear building a sun deck to relax, the octopus drinking heavily with all her pals, and the two final toys trying and adorably failing to be threatening. I’m critiquing “Flu-ouise” for not being tightly focused, yet its looseness is part of its charm. This show either can’t lose or can’t win, I guess, depending on how you want to see it. Either way, this is a damn good premiere. A brilliant little detail was only having music kick in for the bear’s song, with the other Belcher-like toys not getting any music behind them as they started to sing. No question, Gene’s dance was every bit as intriguing as advertised. I could have watched that for a whole lot longer. I loved the continued squabbling between the two Kuchi Kopis during the good Kuchi Kopi’s song. Gene and Linda are heroically good at consuming mustard, no mistake.